For a cigar fan, walking into a humidor displaying new and untried sticks is an enticing moment. Whether it’s that cigar you’ve been wanting to try since you first heard or read about it (maybe the Cain F) or something that just hit the shelves (maybe La Aurora’s 107), smoking a cigar for the first time can be a lot of fun. But if, like me, you don’t smoke several cigars a day, the quest for untried cigars means you can easily neglect those you’ve enjoyed in the past. This point was brought home to me the recently when I was listening to a couple of different podcasts that mentioned cigars I liked but haven‘t smoked in what seems like ages. There’s Arturo Fuente’s Sun Grown line. A few years ago, that was the stick I reached for again and again. Until today, though, I can’t remember the last time I smoked one. That’s a shame. Because not only is the Sun Grown, with its distinctive black band at the foot, a terrific cigar, the Double Chateau vitola is also among the best bargains around. It’s large: 6.75 inches with a 50 ring gauge. It’s excellently constructed and burns like a dream with tons of smoke. It tastes great, with one of the finest finishes anywhere. And it runs about $6. There’s also the Padrón regular line, often referred to as the “Thousands.” The 6000 is a 52 ring gauge torpedo that’s 5.5 inches long. Sometimes called “the poor man’s anniversary” due to some similarities to Padrón’s top-of-the-line cigars, the 6000, in natural and maduro, is another reasonably priced beauty that’s a pleasure to smoke. I’m still crazy about the La Gloria Cubana Medaille d’Or No. 1 Maduro, though I rarely see them at tobacconists anymore. Perhaps that’s why it has been so long–too long–since I’ve enjoyed one. I’m sure each of you can think of cigars that you really liked in the past but somehow got away from smoking as new releases elbowed their way onto the shelves. And I’m not suggesting that anyone abandon the hunt for great new cigars. 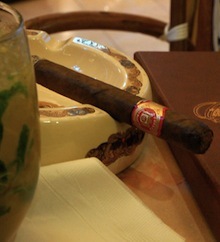 Discovering them is one of the many pleasures of cigar smoking. But so is reconnecting with an old friend. Grab one of yours, and see if you agree. Awesome article, George. This is some great advice for those of us who place too much emphasis on the IPCPR Trade Show and its many releases. So many of my "old friends" are tried-and-true, relatively cheap sticks. I always keep a box of Punch Champions on hand–definintely an old-school cigar that gets better with age–as well as a box of Don Kiki Brown Labels–a treasure that I discovered through StogieGuys.com. The Champions are among my long-time favorites, too. Thanks for the reminder, George. I sometimes worry that some old favorites will be discontinued, and I will partly be to blame. I'll smoke one of the Padron thousands tonight. Part of their being forgotten is that these favorites are not promoted much: No discounts, no events for them=no big push.